Auto Europe UK is a car rental comparison website that rounds up all the best prices for car hire and van hire throughout Europe. If you’re looking for cheap car hire then the site is perfect for showing you all the best options available, from the best price to the most practical pick up point. With a hue range of cars and locations on offer, finding a suitable rental car is easy. However, the site can be a little slow when loading results. Don’t forget to check out the refundable excess coverage – it’s better to be safe than sorry! Your payment card may be required as a form of ID, so keep it on you! 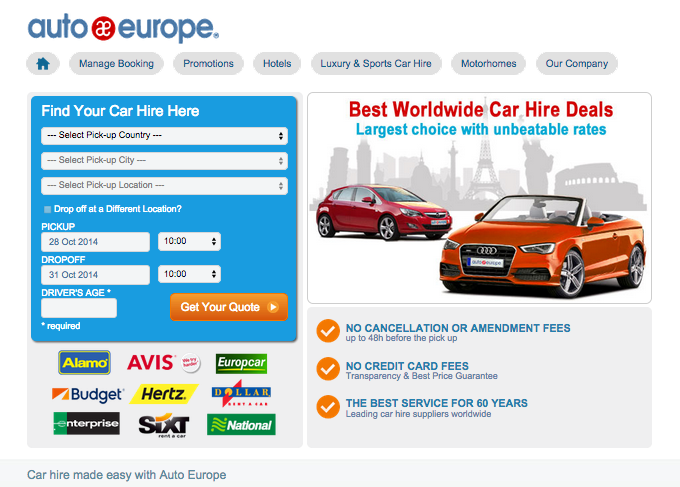 Auto Europe UK is ideal for those who are looking to rent a car and want the best deals around. With a wide range of sites compared and the cheapest prices on the web, there’s no-where better for your car hire needs. Go back to Cheap Car Rental category for all the best sites looking to save you money when travelling the globe.